Washing wool fleece is the first step to getting it ready for carding. Once fleece is carded its ready to use for felting, or spinning it into yarn. Washing the fleece is the foundational step to a successful project. Get this step right and all the next steps will go smoothly and you will get the product at the other end that you desire. Scrimp at this stage and you’ll be struggling with every step hereafter. Wool fleece is greasy and full of sheep sweat and dirt. You need to remove this sweat, dirt, and lanolin (a combination of grease and wax) from the wool to make it easier to work with. You also want to do it without destroying your hands or harming the fleece. Its not a difficult job if you follow some basic principles. But overlook the basic principles for cleaning fleece and you will have a mess. Wool has a proclivity to felt when wet. So wool fleece needs to be handled gently when it is damp or wet. Keep the washing water on the acidic side of 7. Use a large capacity basin that you can cover to keep the heat in. Now lets look at these principles more closely and I’ll explain the reason behind each principle. Once you understand the reason behind each basic principle I’ll show you how I apply this to my own wool washing. While not all wool will felt, most lustre wools and many of the fine wools will felt easily. This is an important value for the felt maker. You can test the fleece you are going to wash for its proclivity to felt by grabbing a few locks, wetting your hands and adding soap and rolling the fleece into a ball. If it refuses to felt, no matter how much you abuse it in this manner, your fleece should be used in a application where felting isn’t necessary. It will also be easier to wash. Most wool fleeces will felt. Felt makers use these qualities to their advantage by shocking the wool with drastic changes in temperature, and by agitating and manipulating the wool. So to avoid felting when washing wool you will need to avoid temperature shocking or rough handling of the wool, while the fleece is wet. Use Dawn dishwashing detergent to degrease and clean the fleece. I don’t normally give you specific product recommendations for your homestead but I make an exception when it comes to washing fleece. Dawn is the very best degreaser available for household use. Dawn is the very best option for water with a high mineral content — ie. hard water. If you have soft water you have a few more options open to you. Orvus paste is also used for fleece washing but it is only effective with soft water. Ditto for homemade soap. 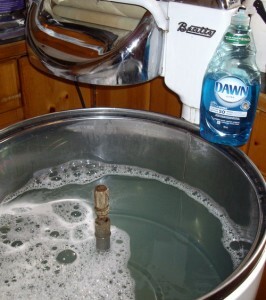 Most liquid detergents, while doing a fair job at cleaning dishes in hard water, don’t have the degreaser that Dawn has. I’ve been disappointed by other brands of dishwashing detergents when I’ve used them instead of Dawn for fleece washing. Dawn is used for cleaning up birds during oil spills. Its that effective as a degreaser. I buy bottles of Dawn and reserve specifically for fleece washing, even when I use other options for washing dishes. Dawn is a chemical and will denature the protein in your hands (its used to break the cell walls in DNA experiments, too). Always wear gloves when putting your hands in water that you’ve added Dawn to. I use 1/2 cup of Dawn per washer load — so about 1 cup of Dawn per fleece, for the 2 washes that I do. A 700ml bottle of Dawn will last you for only 3 fleeces, at a cost of about $1.35 per fleece. Don’t try to save money by using less Dawn. I have hard water. If you have soft water and your fleeces aren’t very dirty, you may get by with half that. Judge your fleece for cleanliness after it is dry and has been in storage for at least 3 months. And then adjust your procedure according to your results with your water. We set the thermostat on our hot water tank at 130F when washing wool. Lanolin melts at 120F but if the water temperature drops to 110F, lanolin will redeposit on your wool. So we start with 130F water and keep it at this temperature at each stage of the wool washing process — for 2 washes and for 2 or 3 rinses. When washing wool, you want to keep the temperature of the rinse water the same temperature as the water you just took the fleece out of. So while 130F is a good temperature to aim for, if you forget about the fleece for several hours, and the water cools down, you’ll want to put the next tub of water at the same temperature as the water you just took the fleece from. If you need to reheat it back to 130F because the lanolin has redeposited, simply increase the temperature slowly by adding hotter water, a little at a time until the desired temperature is reached. If you are spinning your fleece out in your washing machine, make sure the cold water rinse is turned off. You don’t want to spray cold water on your hot fleece, while it is spinning out. If you are washing the fleece in a washing machine, don’t turn on the agitation. And when you want to spin it out or change from the wash water to the rinse water, lift the fleece out of the machine while doing so. This will keep your fleece from felting and prevent the dirt from redepositing on the wool. Alkaline pH will harm the wool and make it coarse. If the pH is high enough, the wool fibers will dissolve completely. Wool is an acid fiber and is softest and has a kinder hand when the pH of the washing water remains at 7 (neutral pH) or below. A bit of vinegar or lemon juice added to the first rinse will keep the fleece soft and return it to its ideal pH, after washing with detergent. 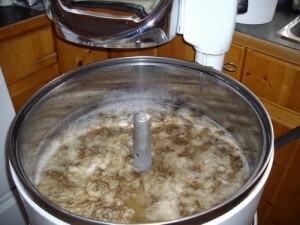 While you can wash wool locks one handful at a time in the kitchen sink, when you are working through several fleeces each season, you’ll want to streamline the process. The idea container for fleece washing is insulated to hold in the heat, can hold 5 to 8 lbs of fleece at one time without overcrowding, (5 to 8 lbs is the size of most skirted adult wool fleeces). Can be covered in order to hold in the heat and prevent the temperature from dropping. I found that the best container for me is a wringer washing machine. Don’t use the pump, though, to drain out the water. To drain use gravity siphon action and drain into a bucket. The drain holes are large and wool can easily be sucked through and will damage the pump. By draining with the help of gravity, you don’t need power to the machine, and you save the pump for other times when you might need it for laundry. You can remove the agitator to give you a larger capacity insulated tub. It has a lid to keep the heat from escaping. I add a thick bathtowel to the lid when I am washing fleece outside. When I allow the machine to drain into a bucket so that I can use the dirty liquid in areas of the garden where we are not growing food. Rinse water can go into the vegetable garden, too. Anything that isn’t rinsed out will be in the fleece when you pick it, card it, or felt it. Clean it really well, at this stage and the whole process will be more fun. I like to wash it twice with detergent, and then rinse twice with clear water, and then do a final rinse with my 1 cup of my special fleece rinse, to keep the fleece soft and repel moths while the wool is in storage. Help! I have successfully cleaned, washed and stored many fleeces and this is a first for me. I opened up a washed and dried fleece that I forgot about (been stored for about 1 year) and it smells like ammonia. Any idea what caused this and do I just need to toss it? It may be that the fleece became damp and started to decompose. Or there might be some urine on it that got missed. Check the soundness of a handful of the staples, by snapping them between your hands. If they easily break, you’ll want to use the fleece for another purpose — maybe lining your hanging baskets. If they remain sound you might just need to air the fleece outside for a few days before you spin it or felt with it. I recieved about 2 pounds of wool that has been cleaned and processed somewhat. It is in thin roving type lengths but it has a fair amount of lanolin in it. I was making small, loose bundles and had lanolin all over my hands. Nice for my hands! Should I wash it? Can i leave the wool as bundles (about 2 oz each) or do I undo them and set the lenghs loosely in a mesh bag or plastic ventilated bucket. I am very new to this craft medium. If it is in roving lengths then it’s ready to spin as is. I have in hand a raw 2018 Rambouillet/cross fleece from a friend-of-a-friend, and I need some help, please. In experimenting with processing this fleece, I find it has some lovely characteristics: high lanolin (feels wonderful!) low suint, low VM. Some locks spin up beautifully in the grease without carding. A good chunk of the fleece has some particularly stubborn brownish cr*p on the very outermost tips of the locks. I skirted the snot out of this fleece, and I have done a double Dawn soak and rinse, keeping the temp above 150F (I use a thermometer). Still, this cr*p is like GLUE on the tips. UGH. First, Betty. Lucky you! That sounds like a gorgeous fleece. Are the tips brittle? Do they break off when you pinch them at the tip and pull? Can you identify the stuff on the tips? Is it feces? Dirt? Pine pitch? Clay soils? Depending on what you are dealing with that might dictate how to proceed. You could simply cut off the tips if the fleece is at least 4 inches in length. Or try a few other ideas. Pine pitch dissolves in cooking oil, for instance. Feces, I’d just skirt that part of the fleece. Dirt or clay might just need individual hand cleaning of the locks. I usually rinse with diluted vinegar to restore the pH and then rinse again with fresh water. Came across your blog. Great instruction on washing fleece. But what is the special fleece rinse? About 7 years ago I visited your farm in my pink smart car. I have a farm now too! I just purchased a wringer washer to wash wool and was wondering if I can use the wringer to felt it. I realize it will be in small lengths if it is possible, but they could be sewn or felted together afterwards. Have you used the wringer to felt wool and if so, is there anything I should know? Thank you. I remember you, Eileen. Nice to hear that you have your own farm. For wool to felt it needs to be shocked with changes in water temperature and with agitation. So the wringer could be the felting agent if you could arrange for the wool to go from very hot to very cold water and back again between the wringing. But I’ve never done that. cup of my special fleece rinse…. have you offer this recipe? This is a very clear set of instructions on washing fleece. I will be recommending this post to people who ask me how to wash their fleece. thanks!